The city of London is one of the most historic capital cities in Europe. Home to British monarchs for more than a thousand years, London has a great deal of architecture spread throughout its footprint that has become iconic around the world. All it takes is a glimpse of some of these places and people can easily place them as Landmarks of Britain. Today, 2018 1 oz Silver British Landmarks of Britain Tower Bridge Coin is available to you online at Silver.com. Ships to you inside of a protective plastic capsule and sealed rolls of 20! Second design issued in the Landmarks of Britain series! 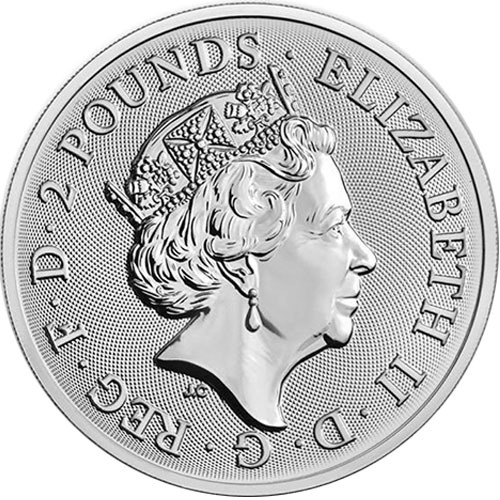 Her Majesty, Queen Elizabeth II features on the coin’s obverse. On the reverse is the image of the Tower Bridge over the River Thames. Landmarks of Britain designs from Laura Clancy and Glyn Davies. In 2017, the Royal Mint introduced a new four-coin series of silver bullion coins with limited mintage figures. Known as the Landmarks of Britain, this collection of silver coins for sale selects just four of the most famous architectural landmarks from the nation of England to feature on the reverse of bullion products fit for investors and collectors alike. All of the 2018 1 oz Silver British Landmarks of Britain Tower Bridge Coins are available for shipping inside of protective plastic capsules. The 2017 Big Ben coin led off the series with the 2018 schedule including this Tower Bridge coin and the 2018 Trafalgar Square coin as well. On the obverse of all 2018 Silver British Landmarks of Britain Tower Bridge Coins is the image of Queen Elizabeth II. Her Majesty is the longest-reigning monarch in the nation’s history and has been on the throne since 1952 when her father King George VI died. This right-profile portrait is the fifth-generation effigy of the Queen during her long reign. 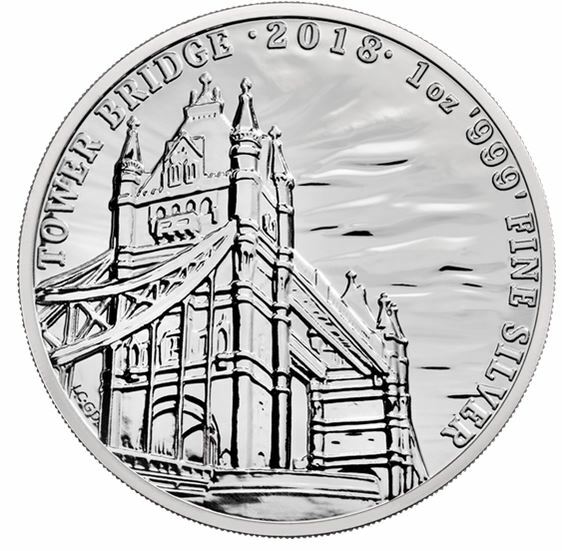 The reverse of the 2018 1 oz Silver British Landmarks of Britain Tower Bridge coin bears the image of Tower Bridge. Conceived the latter half of the 19th century and finally completed in 1894, this suspension bridge with iconic towers enables the movement of tall mast ships between the Pool of London ports and London Bridge. Some 40,000 motorists, cyclists, and pedestrians cross over this icon on a daily basis in the city of London. Please feel free to reach out to Silver.com if you have any questions. Our customer service team is available to you at 888-989-7223, online using our live chat, or by simply sending us an email.